The price of $IOTA (against $BTC) has been getting throttled from the beginning of June to now. This is probably due in large part to the activism of one enthusiastic Twitter user that has been exposing the apparent flaws of the DAG that goes by the name of Sarah Jamie Lewis. That’s the conclusion of the FA for $IOTA, because this not a coin review article. As you can see above on the RSI(14) on the daily for $IOTA — the potential outcome looks pretty bleak here. Here we see a pretty steady drop in the RSI(14) on the daily ranging over the last couple of months. There’s definitely room for the price to drop even further. The Stochastic RSI is even more ominous on the daily. Momentum has already waned and the %K (blue line) has crossed under the %D (orange line). 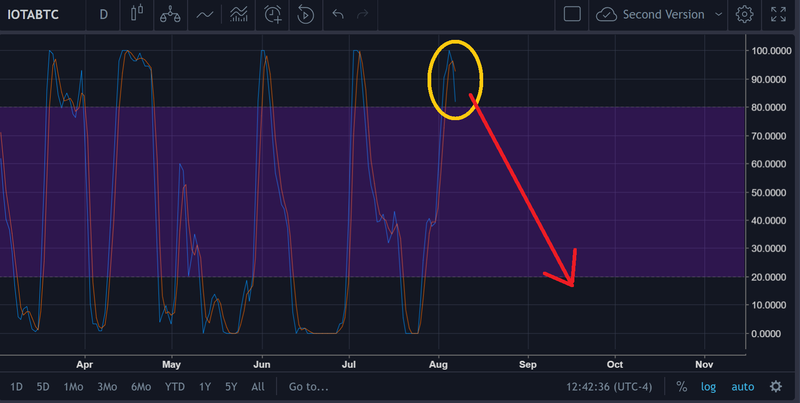 The reason that the Stochastic RSI is technically reading ‘overbought’ while the RSI is nearly oversold on the same daily chart is due to the difference in the periods of time that each of these indicators track. Stochastic RSI tracks a much smaller time frame than the RSI (typically), so it has a tighter reading than the RSI. Therefore, the Stochastic RSI is more indicative of the most recent price movement. It’s almost like have an exponentially weighted RSI (don’t worry if you did not understand that). If the EMA 50 < EMA 200, then that = Death Cross. 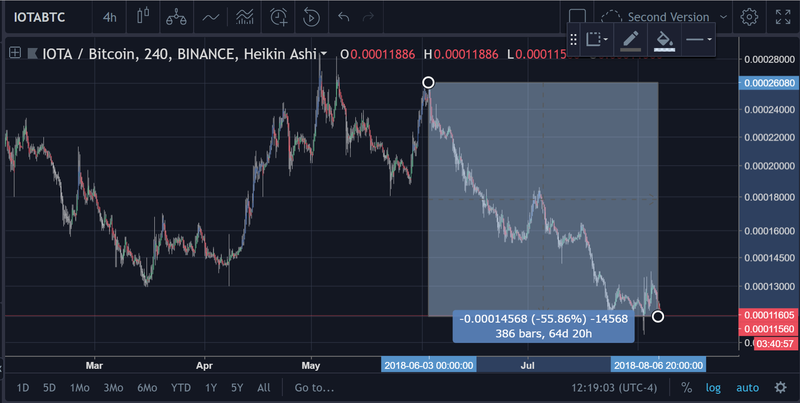 This falls under trader logic that states that when this happens on a chart (specifically the 50 & 200 or the 100 & 200 or the 50 & 100), there is a precipitous decline in the price that will occur sometime after. It does not always happen immediately, but it usually does occur at some point afterward. It is also a major sign of just how bearish ish is really getting on the protocol. This is on the daily, so it has a bit more meaning than it would on lower time frames (higher time frames, just like higher ‘lookback’ settings on a chart tend to correlate with more accuracy, yet less ‘tight’ or responsive signals). 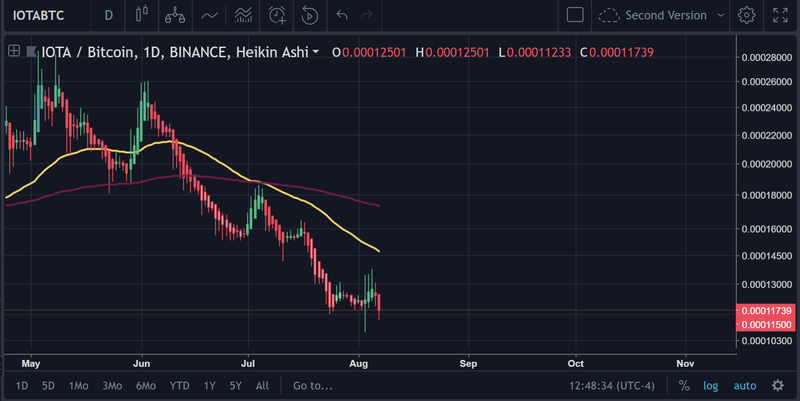 The $IOTA/USD chart is just as ugly. This is something that the author wishes that they could short to zero. But they unfortunately are unable to. Thus, the best option now appears to be remaining hands off entirely.